William Morrow Paperbacks, 9780062059826, 336pp. An executive at a New York cosmetics firm, Sarah has had her fill of the interminable hustle of the big city. When her husband, Josh, is offered a new job in suburban Virginia, it feels like the perfect chance to shift gears. While Josh quickly adapts to their new life, Sarah discovers that having time on her hands is a mixed blessing. Without her everyday urban struggles, who is she? And how can she explain to Josh, who assumes they are on the same page, her ambivalence about starting a family? It doesn't help that the idea of getting behind the wheel—an absolute necessity of her new life—makes it hard for Sarah to breathe. It's been almost twenty years since she's driven, and just the thought of merging is enough to make her teeth chatter with anxiety. When she signs up for lessons, she begins to feel a bit more like her old self again, but she's still unsure of where she wants to go. Then a crisis involving her best friend lands Sarah back in New York—a trip to the past filled with unexpected truths about herself, her dear friend, and her seemingly perfect sister-in-law . . . and an astonishing surprise that will help her see the way ahead. 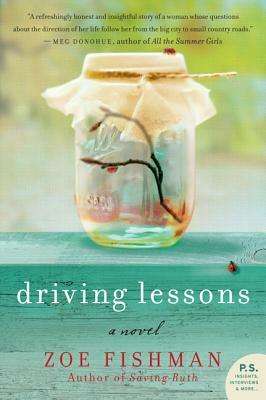 Zoe Fishman is the bestselling author of Inheriting Edith, Driving Lessons, Saving Ruth and Balancing Acts. She’s the recipient of myriad awards, including a NY Post Pick. She’s been profiled in Publisher’s Weekly and The Huffington Post among others. Her writing has been published in The Atlanta Journal Constitution as part of their moving “Personal Journey” series. Zoe worked in the New York publishing industry for thirteen years. She was recently the Visiting Writer at SCAD Atlanta and currently teaches at Emory Continuing Education and The Decatur Writers Studio, at which she is also the Executive Director. She lives in Decatur with her family.